Auschwitz was the largest of the German Nazi concentration and extermination camps. Located in southern Poland, it took its name from the nearby town of Oświęcim (Auschwitz in German), situated about 31 miles west of Kraków and 178 miles from Warsaw. 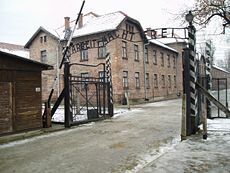 Following the German occupation of Poland in September 1939, the town was incorporated into Germany and renamed Auschwitz. The complex consisted of three main camps: Auschwitz I, the administrative center; Auschwitz II (Birkenau), an extermination camp or Vernichtungslager; and Auschwitz III (Monowitz), a work camp. The first two of them have been on the World Heritage List since 1979. There were also around 40 satellite camps, some of them dozens of miles from the main camps, with prisoner populations ranging from several dozen to several thousand. The camp commandant, Rudolf Höss, testified at the Nuremberg Trials that up to 2.5 million people had died at Auschwitz. The Auschwitz-Birkenau State Museum revised this figure in 1990, and new calculations now place the figure at 1.1–1.6 million, about 90 percent of them Jews from almost every country in Europe. Most of the dead were killed in gas chambers using Zyklon-B; other deaths were caused by systematic starvation, forced labor, lack of disease control, individual executions, and so-called medical experiments. Beginning in 1940, Nazi Germany built several concentration camps and an extermination camp in the area of Auschwitz, which at the time was under German occupation. The Auschwitz camps were a major element in the perpetration of the Holocaust. Auschwitz I, the original concentration camp which served as the administrative center for the whole complex, and was the site of the deaths of roughly 70,000 people, mostly Poles and Soviet prisoners of war. Auschwitz II (Birkenau), an extermination camp, where at least 1.1 million Jews, 75,000 Poles, and some 19,000 Roma (Gypsies) were killed. Auschwitz III (Monowitz), which served as a labor camp for the Buna-Werke factory of the I.G. Farben concern. Like all German concentration camps, the Auschwitz camps were operated by Heinrich Himmler's SS. The commandants of the camp were SS-Obersturmbannführer Rudolf Höß (often written "Hoess"—not to be confused with Nazi Party official Walter Richard Rudolf Hess) until the summer of 1943, and later Arthur Liebehenschel and Richard Baer. Höß provided a detailed description of the camp's workings during his interrogations after the war and also in his autobiography. He was hanged in 1947, in front of the entrance to the crematorium of Auschwitz I. Command of the women's camp, which was separated from the men's area by the incoming railway line, was held in turn by Johanna Langefeld, Maria Mandel, and Elisabeth Volkenrath. Auschwitz I served as the administrative center for the whole complex. It was founded on May 20, 1940, on the grounds of an old Polish brick army barracks (originally built by the Austro-Hungarian Empire). A group of 728 Polish political prisoners from Tarnów became the first prisoners at Auschwitz on June 14 that year. The camp was initially used for interning Polish intellectuals and resistance-movement members, then also for Soviet prisoners of war. Common German criminals, "anti-social elements," and 48 German homosexuals were also imprisoned there. Many Jews were sent to the camp as well, beginning with the very first shipment (from Tarnów). At any time, the camp held between 13,000 and 16,000 inmates; in 1942 the number reached 20,000. The entrance to Auschwitz I was—and still is—marked with the ironic sign “Arbeit Macht Frei,” or “work makes (one) free.” The camp's prisoners who left the camp during the day for construction or farm labor were made to march through the gate to the sounds of an orchestra. The SS selected some prisoners, often German criminals, as specially privileged supervisors of the other inmates (so-called: kapo). The various classes of prisoners were distinguishable by special marks on their clothes; Jews were generally treated the worst. Inmates had to work in the associated arms factories except on Sundays, which were reserved for cleaning and showering and there were no work assignments. The harsh work requirements, combined with poor nutrition and hygiene, led to high death rates among the prisoners. Block 11 of Auschwitz was the "prison within the prison," where violators of the numerous rules were punished. Some prisoners were made to spend the nights in "standing-cells." These cells were about 4.9 feet square, and four men would be placed in them. They could do nothing but stand all night, but were forced during the day to work with the other prisoners. In the basement were located the "starvation cells;" prisoners incarcerated here were given neither food nor water until they were dead. Also in the basement were the "dark cells." These cells had only a very tiny window, and a solid door. Prisoners placed in these cells would gradually suffocate as they used up all of the oxygen in the air; sometimes the SS would light a candle in the cell to use up the oxygen more quickly. Many were subjected to hanging with their hands behind their backs, thus dislocating their shoulder joints for hours, even days. The execution yard was between blocks 10 and 11. In this area, prisoners who were thought to merit individual execution received it. Some were shot, against a reinforced wall which still exists; others suffered a more lingering death by being suspended from hooks set in two wooden posts, which also still exist. In September 1941, the SS conducted poison gas tests in block 11, killing 850 Poles and Soviets using cyanide. The first experiment took place on September 3, 1941, and killed 600 Soviet POWs. The substance producing the highly lethal cyanide gas was sold under the trade name Zyklon B, originally for use as a pesticide used to kill lice. The tests were deemed successful, and a gas chamber and crematorium were constructed by converting a bunker. This gas chamber operated from 1941 to 1942, during which time some 60,000 people were killed therein; it was then converted into an air-raid shelter for the use of the SS. 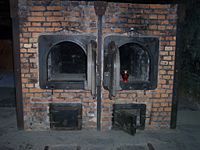 This gas chamber still exists, together with the associated crematorium, which was reconstructed after the war using the original components, which remained on-site. The first women arrived in the camp on March 26 1942. From April 1943 to May 1944, the gynecologist Dr. Carl Clauberg conducted sterilization experiments on Jewish women in block 10 of Auschwitz I, with the aim of developing a simple injection method to be used on the Slavic people. These experiments consisted largely of determining the effects of the injection of caustic chemicals into the uterus. This was extremely painful and many died during and shortly after. Dr. Josef Mengele, who is well known for his experiments on twins and dwarfs in the same complex, was the camp "doctor." He regularly performed gruesome experiments such as castration without anesthetics. Prisoners in the camp hospital who were not quick to recover were regularly killed by a lethal injection of phenol. Entrance, or so-called "death gate," to Auschwitz II-Birkenau, the extermination camp, in 2006. Construction on Auschwitz II (Birkenau) began in October 1941 to ease congestion at the main camp. It was designed to hold several categories of prisoners, and to function as an extermination camp in the context of Himmler's preparations for the Final Solution of the Jewish Question. Many people know the Birkenau camp simply as "Auschwitz." It was larger than Auschwitz I, and many more people passed through its gates than did those of Auschwitz I. It was the site of imprisonment of hundreds of thousands, and of the killing of over one million people, mainly Jews, but also large numbers of Poles, and Gypsies, mostly through gassing. Birkenau had four gas chambers, designed to resemble showers, and four crematoria, used to incinerate bodies. One group, about three-quarters of the total, went to the gas chambers of Auschwitz-Birkenau within a few hours. They included all young children, all women with children, all the elderly, and all those who appeared on brief and superficial inspection by an SS doctor not to be fully fit. In the Auschwitz-Birkenau camp, more than 20,000 people could be gassed and cremated each day. Here, the Nazis used a cyanide gas produced from Zyklon B pellets, which were manufactured by two companies who had acquired licensing rights to the patent held by IG Farben. The two companies were Tesch & Stabenow of Hamburg, which supplied two tons of the crystals each month, and Degesch of Dessau, which produced three-quarters of a ton per month. The bills of lading were entered as evidence at the Nuremburg trials. A second group of prisoners were used as slave labor at industrial factories for such companies as IG Farben and Krupp. At the Auschwitz complex, 405,000 prisoners were recorded as slave laborers between 1940 and 1945. Of these, about 340,000 perished through executions, beatings, starvation, and sickness. Some prisoners survived through the help of German industrialist Oskar Schindler, who saved about 1,100 Polish Jews by diverting them from Auschwitz to work for him, first in his factory near Kraków, and later at a factory in what is now the Czech Republic. The fourth group was composed of women who were selected to work in "Canada," the part of Birkenau where prisoners' belongings were sorted for use by Germans. The name "Canada" was very cynically chosen. In Poland it was—and is still—an expression used when viewing, for example, a valuable and fine gift. The expression comes from the time when Polish emigrants were sending gifts home from Canada. The camp was staffed partly by prisoners, some of whom were selected to be kapos (orderlies) and sonderkommandos (workers at the crematoria). The kapos were responsible for keeping order in the barrack huts; the sonderkommandos prepared new arrivals for gassing (ordering them to remove their clothing and surrender their personal possessions) and transferred corpses from the gas chambers to the furnaces, having first pulled out any gold that the victims might have had in their teeth. Members of these groups were killed periodically. The kapos and sonderkommandos were supervised by members of the SS; altogether 6,000 SS members worked at Auschwitz. By 1943, resistance organizations had developed in the camp. These organizations helped a few prisoners escape. The escapees took with them news of exterminations, such as the killing of hundreds of thousands of Jews transported from Hungary between May and July 1944. In October 1944, a group of sonderkommandos destroyed one of the crematoria at Birkenau. They and their accomplices, a group of women from the Monowitz labor camp, were all put to death. It was also not uncommon that if one prisoner escaped, selected persons in the escapee's block were killed. When the Soviet army liberated Auschwitz on January 27, 1945, they found about 7,600 survivors abandoned there. More than 58,000 prisoners had already been evacuated by the Nazis and sent on a final death march to Germany. In 1947, in remembrance of the victims, Poland founded a museum at the site of the Auschwitz concentration camp. By 1994, some 22 million visitors—700,000 annually—had passed through the iron gate of Auschwitz I crowned with the cynical motto, "Arbeit macht frei" ("Work will set you free"). 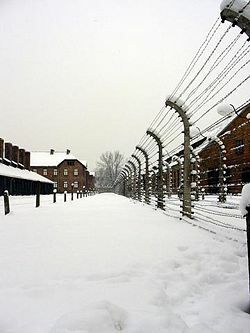 Approximately 40 more satellite camps were established around Auschwitz. These were forced-labor camps and were known collectively as Auschwitz III. They were closely connected to German industry and were associated with arms factories, foundries, and mines. The first and largest was built at Monowitz to hold Poles who had been forcibly evacuated from their hometowns by the Nazis. The inmates of Monowitz were forced to work in the chemical works of IG Farben. In regular intervals, doctors from Auschwitz II would visit the work camps and select the weak and sick for the gas chambers of Birkenau. The largest subcamps were built at Trzebinia, Blechhammer, and Althammer. Female subcamps were constructed at Budy; Plawy; Zabrze; Gleiwitz I, II, and III; Rajsko; and at Lichtenwerden (now Světlá). 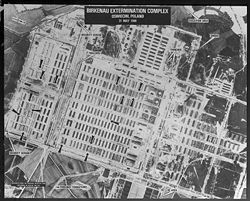 Photograph of Birkenau, taken May 31, 1944, by a plane of the South African Air Force, sent to photograph the fuel factory at nearby Monowitz. It was identified only in the late 1970s and analyzed by the CIA in 1978. Smoke can be seen issuing from Crematorium V.
Some information regarding Auschwitz reached the Allies during 1941–1944, such as the reports of Witold Pilecki and Jerzy Tabeau, but the claims of mass killings were generally dismissed as exaggerations. This changed with receipt of the very detailed report of two escaped prisoners, Rudolf Vrba and Alfred Wetzler, which finally convinced most Allied leaders of the truth about Auschwitz in the middle of 1944. Detailed air-reconnaissance photographs of the camp were taken accidentally during 1944, by aircraft seeking to photograph nearby military-industrial targets, but no effort was made to analyze them. It it was not until the 1970s that these photographs of Auschwitz were looked at carefully and properly understood. Starting with a plea from the Slovakian rabbi Weissmandl in May 1944, there was a growing campaign to convince the Allies to bomb Auschwitz or the railway lines leading to it. At one point Winston Churchill ordered that such a plan be prepared, but he was told that bombing the camp would most likely kill prisoners without disrupting the killing operation, and that bombing the railway lines was not technically feasible. Later, several nearby military targets were bombed. One bomb accidentally fell into the camp and killed some prisoners. The debate over what could have been done, or what should have been attempted even if success was unlikely, has continued heatedly ever since. About 700 prisoners attempted to escape from the Auschwitz camps during the years of their operation, with about 300 attempts successful. A common punishment for escape attempts was death by starvation; the families of successful escapees were sometimes arrested and interned in Auschwitz and prominently displayed to deter others. If someone did manage to escape, the SS would kill ten random people from the prisoner's block. Since the Nazi regime was designed to degrade prisoners psychologically, maintaining the will to survive was seen in itself as an act of rebellion. Survivor Primo Levi was given this very teaching from his fellow prisoner and friend Steinlauf: "[That] precisely because the camp was a great machine to reduce us to beasts, we must not become beasts; that even in this place one can survive, and therefore one must want to survive, to tell the story, to bear witness; and that, if we want to survive, then it's important that we strive to preserve at least the skeleton, the scaffolding, the external shape of civilization." In 1943, the Kampf Gruppe Auschwitz was organized with the aim to send out as much information about what was happening in Auschwitz as possible. In addition to smuggling reports to the outside world through escapees, the group buried notes in the ground in the hope a liberator would find them and smuggled out photos of the crematoria and gas chambers. The gas chambers of Birkenau were blown up by the SS in November 1944, in an attempt to hide their crimes from the advancing Soviet troops. On January 17, 1945, Nazi personnel started to evacuate the facility; most of the prisoners were forced on a death march West. Those too weak or sick to walk were left behind; about 7,500 prisoners were liberated by the 322nd Infantry unit of the Red Army on January 27, 1945. The exact number of victims at Auschwitz is impossible to fix with certainty. Since Germans destroyed a number of records, immediate efforts to count the dead depended on the testimony of witnesses and the defendants on trial at Nuremberg. While under interrogation Auschwitz commandant Rudolf Höß, who was in charge of the camp from 1940 to 1943, said that 2.5 million Jews had been killed there. Later he wrote, "I regard two and a half million far too high. Even Auschwitz had limits to its destructive possibilities." Adolf Eichmann gave a figure of 2 million. Soviet and Polish authorities maintained a figure "between 2.5 and 4 million," which was used on the original Auschwitz memorial. In 1983, French scholar George Wellers was one of the first to use German data on deportations to estimate the number killed at Auschwitz, arriving at 1.613 million dead, including 1.44 million Jews and 146,000 Catholic Poles. A larger study started around the same time by Franciszek Piper used time tables of train arrivals combined with deportation records to calculate 1.1 million Jewish deaths and 140,000-150,000 Catholic Polish victims, along with 23,000 Roma & Sinti (Gypsies). According to Harmon and Drobnicki, relevant estimates—excluding those of outright Holocaust deniers—are in range between 800,000 and five million people. After the war, the camp served through most of 1945 as a Soviet NKVD prison, then for several years remained in a state of disrepair. The Buna Werke factories were taken over by the Polish government and became the foundation for the region's chemical industry. UNESCO World Heritage Site. Ruins at Birkenau, with brick chimneys belonging to wooden barracks being prominent, 2002. The Polish government then decided to restore Auschwitz I and turn it into a museum honoring the victims of Nazism; Auschwitz II, where buildings (many of which were prefabricated wood structures) were prone to decay, was preserved but not restored. Today, the Auschwitz I museum site combines elements from several periods into a single complex. However, in most cases the departure from the history is minor, and is clearly labeled. The museum contains very large numbers of men's, women's, and children's shoes taken from their victims; also suitcases, which the deportees were encouraged to bring with them, and many household utensils. One display case, some 98 feet long, is wholly filled with human hair which the Nazis gathered from the people before and after they were killed. Auschwitz II and the remains of the gas chambers there are also open to the public. 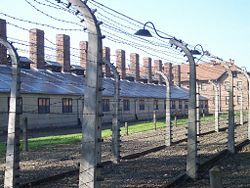 The Auschwitz concentration camp is part of the UNESCO list of World Heritage Sites. 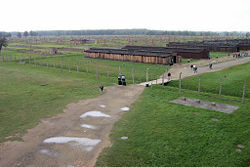 Because the ashes of the victims of the SS were scattered between the huts, and the entire area is seen as a grave site. Most of the buildings of Auschwitz I are still standing. Many of them are now used as museums. The public entrance area (with bookshop) is outside the perimeter fence in what was the camp admission building, where new prisoners were registered and given their uniforms, and so on. Most of the buildings of Birkenau were burnt down by the Germans as the Russians came near, and much of the resulting brick rubble was removed in 1945 by the area's returning Polish population to restore farm buildings before winter. That explains the "missing rubble" cited as evidence by Holocaust deniers. By the site of its gas chambers and incinerators are piles of broken bricks which were thrown aside in the search for fallen re-usable intact bricks. Today, the entrance building remains plus some of the brick-built barracks in the southern part of the site, but of the wooden barracks, some 300 in number, just 19 are still standing, 18 of these in a row near the entrance building and one more, on its own, further away. Of most of the others just chimneys remain, two per barrack, one at each end with a raised duct linking them, remnants of a largely ineffective means of heating. Many of these wooden buildings were constructed from prefabricated sections made by a company that intended them to be used as stables; inside, numerous metal rings for the tethering of horses can still be seen. At the far end of Birkenau are memorial plaques in many languages including Romani. In 1979, the newly elected Polish Pope John Paul II celebrated Mass on the grounds of Auschwitz II to some 500,000 people. After the pope had announced that Edith Stein would be beatified, some Catholics erected a cross near bunker 2 of Auschwitz II where she had been gassed. A short while later, a Star of David appeared at the site, leading to a proliferation of religious symbols there; eventually they were removed. Carmelite nuns opened a convent near Auschwitz I in 1984. After some Jewish groups called for the removal of the convent, representatives of the Catholic Church agreed to this in 1987. One year later the Carmelites erected the 26-foot-tall cross from the 1979 mass near their site, just outside block 11 and barely visible from within the camp. This led to additional protests by Jewish groups, who said that mostly Jews were killed at Auschwitz and demanded that religious symbols be kept away from the site. The Catholic Church instructed the Carmelites to move by 1989, but they stayed on until 1993, leaving the large cross behind. In 1998, after further calls to remove the cross, some 300 smaller crosses were erected by local activists near the large one, leading to further protests and heated exchanges. Following an agreement between the Polish Catholic Church and the Polish government, the smaller crosses were removed in 1999, but the large papal one remains. In 1996, Germany made January 27, the day of the liberation of Auschwitz, the official day for the commemoration of the victims of "National Socialism." 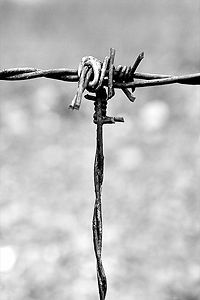 January 27, 2005, the sixtieth anniversary of the liberation of Nazi Germany's death camp at Auschwitz-Birkenau, where a combined total of up to 1.5 million Jews, Roma, Poles, Russians, and prisoners of various other nationalities, were murdered, is not only a major occasion for European citizens to remember and condemn the enormous horror and tragedy of the Holocaust, but also for addressing the disturbing rise in antisemitism, and especially anti‑semitic incidents, in Europe, and for learning anew the wider lessons about the dangers of victimizing people on the basis of race, ethnic origin, religion, social classification, politics, or sexual orientation. ↑ Brian Harmon and John Drobnicki, Historical sources and the Auschwitz death toll estimates. Retrieved August 20, 2007. Doyle, John. The Boy in the Striped Pyjamas. David Fickling Books, 2006. ISBN 0-385-75106-0. Gilbert, Martin. Auschwitz and the Allies. Holt, Rinehart and Winston, 1981. ISBN 0-03-057058-1. Levi, Primo. If This Is a Man. Orion P., Deutsch, 1960. OCLC 58902383. Muller, Filip. Eyewitness Auschwitz: Three Years in the Gas Chamber. Ivan R. Dee, 1999. ISBN 1-56663-271-4. Nyisli, Miklos. Auschwitz: A Doctors's Eye-witness Account. Mayflower, 1977. ASIN B000QIZILC. Rees, Laurence. Auschwitz: A New History. New York: Public Affairs, 2005. ISBN 1-58648-303-X. This page was last modified on 6 December 2016, at 17:01.